I have a Nook and wouldn't say it's increased my reading. It's just another format for it. Sometimes I read at night but mostly I get my reading in at lunch break at work or at the kids' Little League games. Also, when I take them to the river I bring a paperback. Thanks for the recommendation! 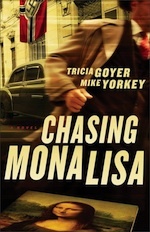 I read Chasing Mona Lisa on my Nook. I loved it! I love reading fiction on my Nook. I especially like that I can read my Nook on the treadmill (even though I can't read books or magazines while walking). For nonfiction, I prefer paper so I can write in the margins and flip easily to what I want to refer to. Hi Jess - I still prefer "real" books, but I love the portability of the Kindle. I carve out time to read when I can. Bible reading is first thing in the morning. Other reading(craft, entertainment) comes in the evening, usually. 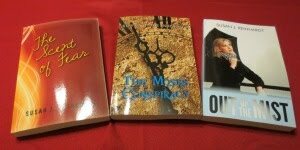 In preparing for my non-fiction reviews I have done recently, I did them in the late-afternoon/early evening. I have thought about checking into getting an e-book reader. But I like being able to curl up under a blanket or a throw and read. I also like the feel and smell of the pages of a real book. Call me old-fashioned, if you want. Hi Brooke - Yes, I found reading impossible at the gym until I received my Kindle. It makes my workouts go super fast! These days I am collecting Kindle versions of books faster than I'll ever be able to read them :( At least one free book a day. I don't mind reading on my laptop, even though I resisted e-books for a while. I think I must admit I am a Kindle convert. The Kindle is convenient, but I hope it never replaces print books. I'd miss seeing all those volumes on my bookshelves. Hmm, they could become the antiques of the 2100 - not that we'd be here to see it!